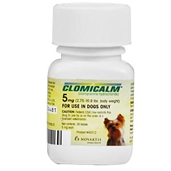 Shop for dog anxiety medications at VetDepot.com. 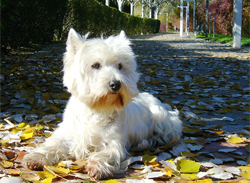 Owners often have a hard time believing that their dogs could be suffering from anxiety. After all, dogs don't have to hold down a job and pay the bills; what is there to be anxious about? But canine anxiety can severely disrupt the bond between dogs and their owners. Anxiety is a feeling of nervousness, uneasiness or apprehension, which is normal under certain circumstances but can become a problem if it becomes severe and/or occurs at inappropriate times. Dogs often develop anxiety associated with particular triggers. "If your dog's anxiety is severe or worsens despite your attempts to treat it at home, make an appointment with your veterinarian or a veterinary behaviorist." For example, some dogs become extremely agitated if their owners leave them alone. This is called separation anxiety. Other dogs may be terrified when a thunderstorm is in the area or if they hear fireworks going off nearby. If you believe that your dog suffers from anxiety, remember that he is truly scared, not just being "bad." Punishment is absolutely the wrong response in this situation and will actually make the situation worse rather than better. The goal when treating a dog with an anxiety disorder is to get him to relax and then provide positive reinforcement while he remains calm. Dog owners also have a number of anxiety relief options that may help, particularly when used in combination with teaching, a dog to relax in the face of stress. Sprays, diffusers, collars and wipes are available that contain dog appeasing pheromone, a substance that nursing females emit to calm their pups. Many different nutraceutical, herbal or homeopathic formulations have also been designed to help anxious dogs. The over-the-counter medication diphenhydramine (Benadryl) may help with mild anxiety that is limited to particular events, like riding in a car. Talk to your veterinarian about this option and what the correct dose would be for your dog. If your dog's anxiety is severe or worsens despite your attempts to treat it at home, make an appointment with your veterinarian or a veterinary behaviorist. These doctors can diagnose the particular type of disorder that your dog suffers from and come up with a behavioral modification plan that will best suit your dog's particular needs. In some cases, he or she may also prescribe medications like Clomicalm or amitriptyline to increase the effectiveness of the behavioral modification protocol. If a dog's anxiety is limited to particular events (e.g., travel or firework displays), a short term sedative may be all that is needed. In these cases, a veterinarian may prescribe a medication such as acepromazine that should be given a few hours before the offending event.